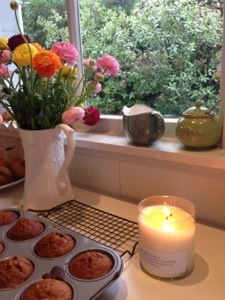 New Zealand Home Cook | My personal food journal…passion for food and the pleasures of delicious home cooking. Smoky smoked salmon is the perfect fast food when you want dinner on the table ASAP. 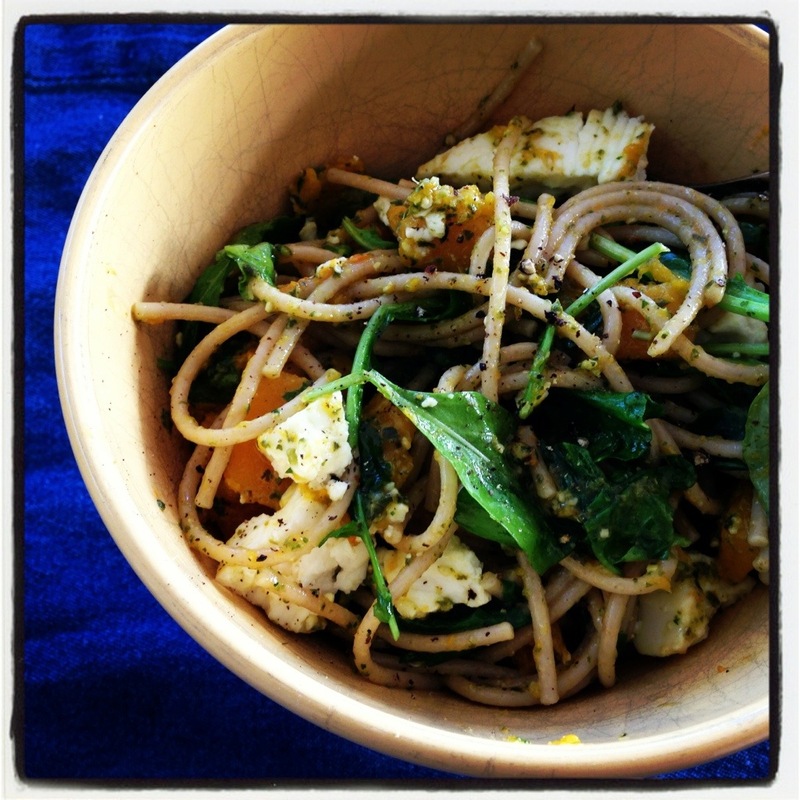 If only bought fast food tasted this good; this is natural, simple ingredients put together to make an easy light meal. 100 grams sour cream with a squeeze of lemon juice to loosen it. 1/ prepare couscous according to packet instructions. 3/ pre heat oven to 190 degrees and snap ends of asparagus and wash and drizzle with olive oil, sea salt, cracked pepper. Add the feta cheese to this by breaking Into chunks and make sure it has some olive oil and seasoning on it too. Roast this on a tray for approx 12-18 min till the asparagus is tender and feta a bit browned. 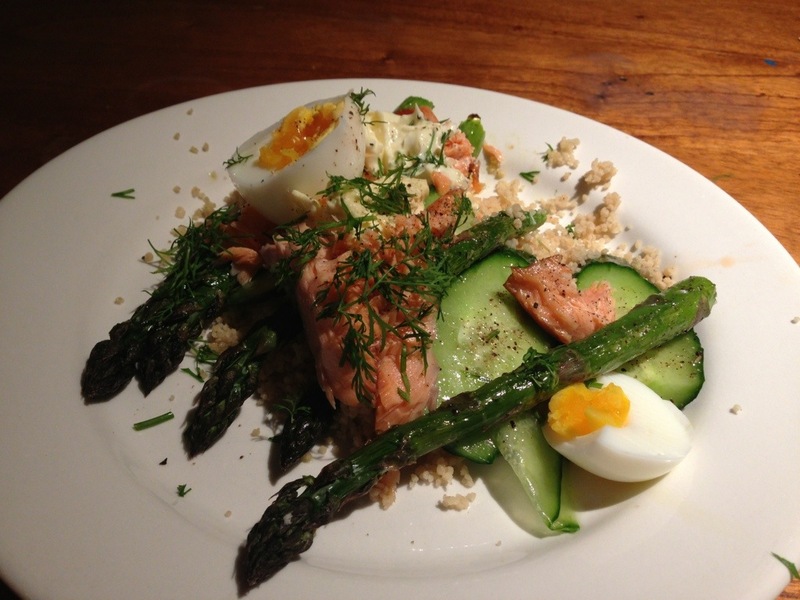 4/ assemble salad couscous, cucumber , asparagus, salmon broken into chunks, spur cream, feta, egg and dill.more seasoning. Just when everyone is trying to eat themselves slim and stick to their New Years resolutions, I am doing neither. Instead I am enjoying today’s freshly picked organic strawberries with eggy French toast or sometimes known as gypsy bread. Though looking at this gorgeous plate of food I am not sure this conjures up gypsy food?. So french it is, Pain Perdu, usually made from yesterday’s bread. 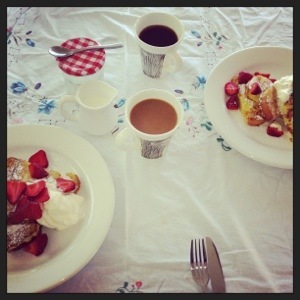 I took Diana Henry (celebrated food writer) lead and made my pain Perdu with brioche. 2 eggs, 1 egg yolk, 2 tablespoons caster sugar, 150 mls cream. Beat this together in a shallow bowl or dish. 8 slices of brioche, cut in half. Lay them in the eggy mixture for 5 minutes. Melt a knob of butter in. Frying pan and fry the brioche until they Are golden. Set aside to drain on paper towels. 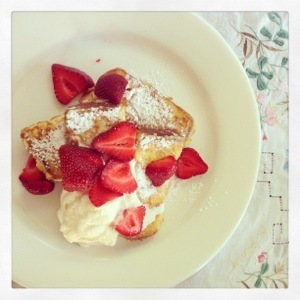 Serve with whipped cream, icing sugar and sliced strawberries. There are times that I struggle to get the oomph for 16.9 minutes at the stove, wooden spoon in hand, stirring and stirring my risotto to creaminess. So I don’t, I relax, pour a glass of wine, put the risotto inside a hot oven to bake and step away from the oven and forget about it for 20 minutes. You can virtually change this risotto up with whatever ingredients you have at hand according to the seasons. I have been thoroughly enjoying the new season broad beans with just about everything and they go beautifully with this risotto. I love how they enliven it up from tasting too stodgy, and the fresh herbs, cheese and lemon juice makes this really fresh tasting. A cast iron with a lid is ideal to cook this in. 1. Preheat your oven to 200 deg. On top of your stove Heat oil and butter over gentle heat and cool celery, onion, garlic and carrot for 7-10 minutes until they have softened but not browned. Add the pumpkin. 2. Add the rice and increase the heat a little so it toasts for about 30 seconds or so. Then add the wine, wait for it to evaporate. 3. Add the tomatoes, stock and butter. Bring to the boil then clamp on a lid and place in your hot oven for approx 20 – 25 minutes. Start checking it at 20 minutes to make sure it does not dry out and that it is cooked enough. Once cooked remove from oven and stir through Parmesan cheese and fresh chopped herbs. Then check for seasoning. Place the lid back on for it to sit for a minute. 4. Put the kettle on. Get your broad beans podded. Place a pot on the stove with hot boiling salted water. Drop the broad beans into the boiling water to cook until they go bright green or 2-4 minutes depending if they are very small or very big. 5. Remove and drain and refresh in ice cold water. Dress with best olive oil, lemon juice, sea salt. 6. 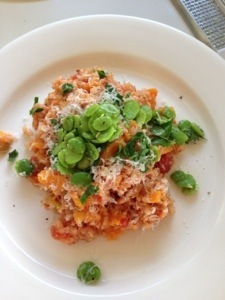 To serve, spoon risotto into bowl and spoon broad beans over the top of the risotto and eat immediately. I recommend lots of freshly cracked black pepper. A good balanced lunch always sets me up for the afternoon and helps avoid a four pm energy dip. I have recently discovered this lovely brand of Italian organic whole meal dried only takes 7 minutes to cook. It makes a good base to add pesto, seeds, nuts, cheeses, perhaps a poached egg for protein and vegetables too. Whatever is in your fridge. The whole meal pasta has a nutty flavour. I always feel good adding more fibre to my diet. 1:bring a pot of well salted water to the boil, cook pumpkin with pasta until al dente, drain (retain a few tablespoons of the water) and return to the pot with the few tablespoons of water. 2: add the rest of the ingredients and toss with extra virgin olive oil and cracked pepper. 3: serve. This would be good at room temperature also. I am a romantic gourmand and am pining to experience food in Europe. Until then I have my cook books and am a very enthusiastic cook and an even more enthusiastic eater. Cooking and sharing vibrant, fresh food makes me feel vital and happy. 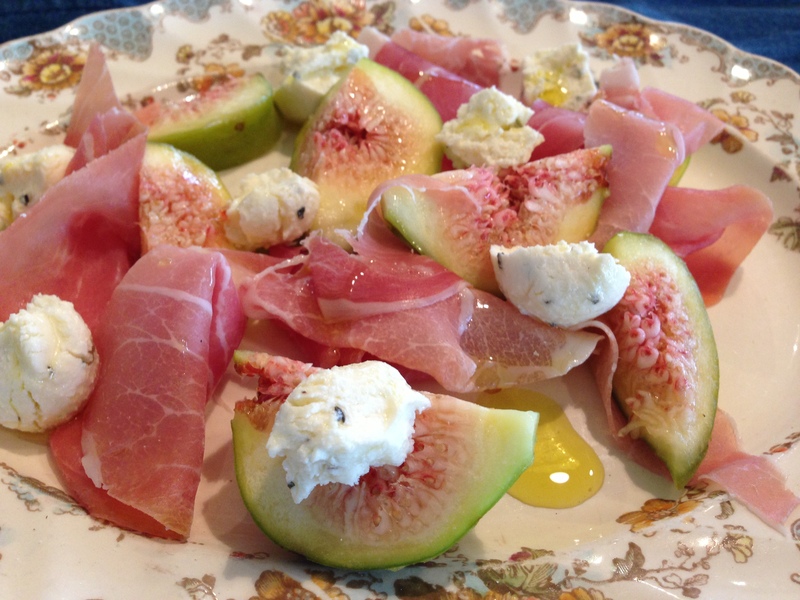 I am inspired by the timeless dishes of Mediterranean Europe and their food simplicity. 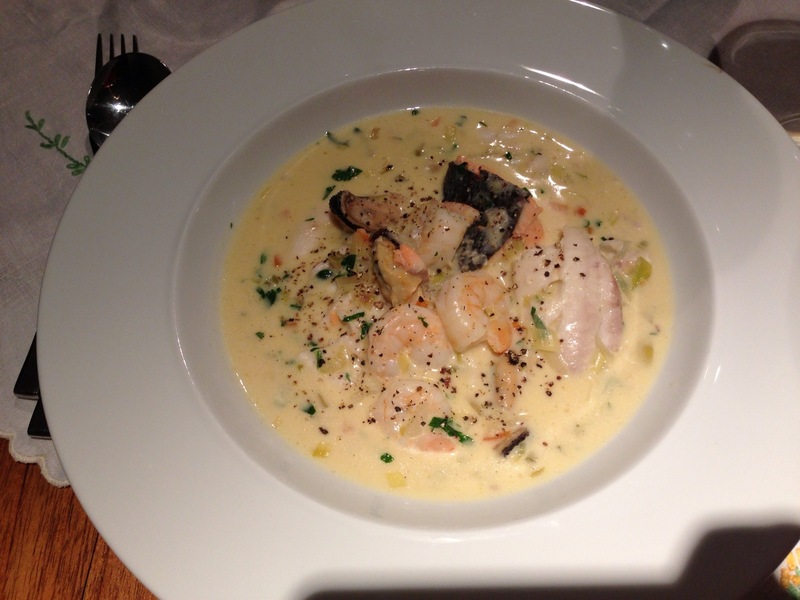 I adore the flavours and home style dishes of Greece and Islands, Italy and France. Eastern European and Italian peasant food is continuously a revelation in its basic simplicity and frugalness. North African and Middle Eastern food is fascinating and exciting to cook. What I am cooking with at the moment, almost all is locally produced. Through taste experience I know that locally grown food that has not travelled by aeroplane or boat tastes so much more juicier, tastier and is always more satisfying. Seasonal produce from my local Christchurch, New Zealand Farmers markets. We are heading into a bright and beautiful autumn. I am enjoying the new season squash and pumpkins, bio dynamically grown snow peas, leeks, fennel bulb, radish, French green beans, locally smoked chicken, olives, Italian quality De Cecco dried pasta, shiny green puy style lentils, fresh herbs, ground spices, nuts, free range chicken, New Zealand lamb, free range pork, dry cured bacon, smoked fish. Farro, red rice, brown lentils, chickpeas, brown rice, oats, stone ground local fresh flours- oat, spelt/dinkel, spelt, rye, buckwheat, vanilla pods and essence, 72% dark chocolate, ground almonds, organic clotted cream, whole milk, Italian parmesan cheese, Clearwater full fat yoghurt http://www.clearwaterorganic.co.nz/ organic butter, coconut oil, Also love artisan bread, agria and new potatoes, orange and red kumara, vine and cherry locally grown sweet tasting tomatoes, creamy organic avocado, onion, local plump juicy garlic, ginger, celery, cauliflower, baby spinach, rocket, soft lettuces, carrots, pumpkin, courgettes, portobello mushrooms, apples, bananas, oranges, raspberries, blueberries. I love to shop and it is a lovely pleasure to buy food for your family to cook. I usually shop at the Farmers market once a week for my fresh produce and sometimes supplement that with greens from Liberty organics. I purchase meats every day or every third day depending how organised I am or how much protein or meats we are eating. I do like to make a plan for the week as to what and how I will go about you my produce and leftovers. I buy these magnetic meal planners from Kikki K shop. I buy fish from the fish market fresh on the day I plan to use it. I try to avoid buying any seafood on a Sunday as it can be a bit old which is usually what happens if you purchase from the supermarket. I like to keep a really well stocked store cupboard with spices, canned beans, rice, pasta, nuts, oils, vinegars. Best store cupboard meal, what would you make? 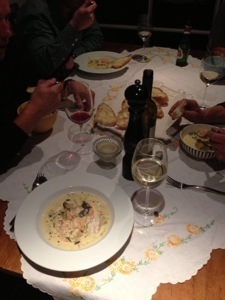 Risotto; rice, good stock, best cheese, seasonal vegetable…think smoked goats Gouda and green cauliflower with sourdough and thyme croutons. I love its oozing, soothing ability to calm; each mouthful is like eating relaxation. What don’t people know about you that you wish they did? As a self-taught cook, who would you say have been your biggest influences? I had if you like an epiphany, I could loan these books from the library and be imparted cooking wisdom and knowledge from the most inspiring talented, creative cooks. I especially love these food writers; Diana Henry, Tamasin Day-Lewis, Nigella Lawson, Harry Eastwood, Nigel Slater, Rachel Allen, Tessa Kiros, Annabel Langbein, Bill Granger, Elizabeth David and Lindsey Bareham to name some of my favourites. I also soaked up each issue of my subscription to DISH magazine, a New Zealand food magazine. Online food blogs and BBC food TV website was a continual source of inspiration. Do you have a guilty food pleasure when no-one else is around? My favourite late night dessert indulgence is homemade hot chocolate fudge sauce, vanilla ice-cream and toasted nuts, especially during my two pregnancies. Well it was the first time I made carrot cake. I got through making the cake perfectly, iced it with thick cream cheese icing and decorated it beautifully with walnuts. It was looking divine and I could not wait to try it. It was loaded into the back seat of my car to take to a friend’s house. We had arrived, as we were standing outside the car greeting our friends; when to shock horror (it was like in life in pictures slow motion) a friends dog jumped into the car, we yelped, the dog freaked and leaped into the back seat, paws straight into the cake and then sat on it!.